When the American Civil War began there were 33 stars on the United States Flag, a star-field count that saw the nation tearing itself apart. This Zaricor Flag Collection Grouping contains three remarkable 33 star flags: the first United States flag captured in January 1861, some four month prior to the firing on Ft, Sumter; the earliest known California militia national color used in the 9 April 1861 "Settlers War", some three days before Confederate guns fired on Ft. Sumter; and, an exquisite 33 star Grand Luminary camp flag from Pennsylvania. There are two flags associated with the 19 April 1861 "Pratt Street Riots", generally regarded by historians as the first bloodshed of the American Civil War. The period of 1861 to 1863 saw the nation transition into the 34 star flag with the admission of Kansas. Four of the most interesting 34 star flags in this Grouping are a flag bearing a New Haven, CT address and a list of early Civil War battles inked upon the hoist; a Recruiting Flag from the 7th New Jersey Infantry that once belonged to the Wall St. financier Calvin Bullock; a Missouri Home Guard color and a unique and handsome flags bearing the so-called "Snowflakes" star field. The Grouping also contains two rare and early mounted troop guidons, one for the cavalry and one for the artillery adorned with battle honors. 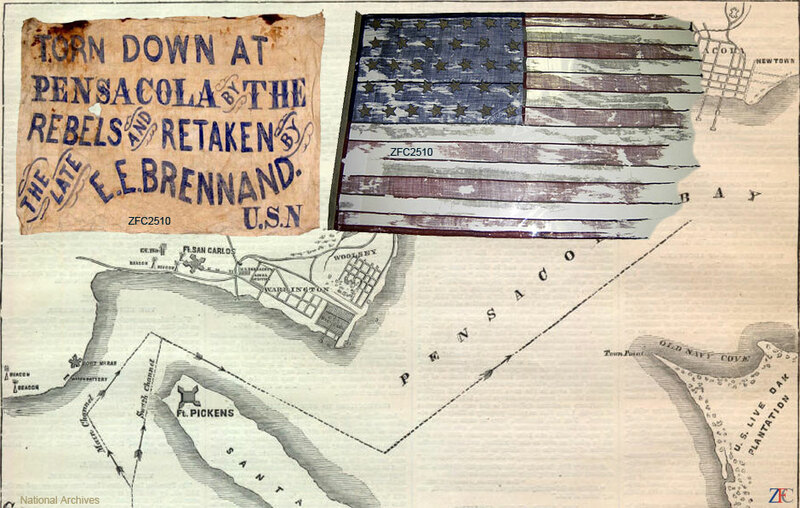 There is also a selection of extremely rare flag carrying slings & belts and flagstaff cords & tassels used by color guards early in the conflict and ephemera relating the opening years of the American Civil War; some patriotic postal covers; a 1937 Diamond Jubilee banner for the pivotal battle of Antietam; and a U.S. Quartermaster volume on American Civil War Designating flags.